The biggest reward of learning computer science for Issaquah student Hallie Chen was computational thinking, or breaking down problems into segments to solve one at a time. The benefits of computer science extend far beyond coding for any student, she argues. Learning how to code didn’t come naturally. I spent countless nights trying to find a rule or concept to help me perform simple, seemingly useless tasks. One that stumped me: reversing a list of five numbers. Search as I might in textbooks, there was no scientific concept to get me through the slog. What I needed to do to find the answer was to liberate myself from the mindset that 10 years of formal schooling had drilled in to me — as long as you memorize an equation, definition, or process, you can solve the problem. That’s not how computer science works. Instead of plugging numbers into an equation Isaac Newton discovered 300 years ago, computer science makes me the Newton: I have to think actively and work through the process, each and every time. Though it felt tedious at first, the biggest reward was computational thinking, or the process of breaking down problems into segments to first solve individually, one at a time. The benefits of computer science extend far beyond coding, and that’s why every student should take computer science. It shouldn’t be an elective, but a required course. It’s too important for them to pass up. While I was interviewing for a variety of summer jobs — not one primarily concerned with computer science — almost every employer asked if I knew how to code. Computer science is applicable in any field, and not only because of how technological the world is becoming. Learning it has improved the fundamental ways I think and solve issues in every area of my life, even though I don’t want a programming career. “This natural approach that you learn when you code is a strategy used no matter what field you’re in,” said Chad Magendanz, a former Republican state representative from Issaquah, who supported CS education bills. Gradually, I began to understand what he meant. Humans can easily reverse a list of five numbers by themselves, for example, but if there are 5 billion, they’d need a computer. But first I had to write an algorithm to push the first of my measly five numbers back, then the second and so on. No problem is too big to solve when looked at in chunks, and that’s where it gets fun. Computational thinking emphasizes the process of relying on one’s own reasoning instead of a list of predetermined concepts. I couldn’t agree more, but if I had seen that quote just two years ago, I would have rolled my eyes. Before I had ever tried it, I thought of computer science as an industry reserved exclusively for people like Zuckerberg: genius, wealthy and male. It’s likely that many other girls and minorities believe the same. When I finally decided to try AP Computer Science, where that poster hangs, I was one of three girls in a class of almost 30 boys. According to Code.org, a nonprofit organization devoted to expanding student access to CS, only 27 percent of all Washington students who took APCS in 2018 were girls. Those disparities also exist in the workplace. Whether it becomes the first step to fixing demographic disparities in the workplace or to giving students an invaluable logical thinking tool, let’s take Zuckerberg’s hint now rather than later. Let’s make the smart decision to teach every student computer science. 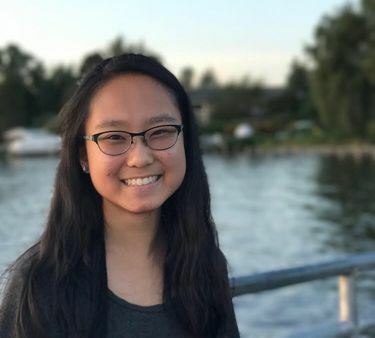 Hallie Chen is a student at Liberty High School in Issaquah who aspires to combine her passions for science and business in her future career. She also enjoys practicing modern calligraphy, playing with her two cats and drinking gallons of bubble tea.